A few weeks ago, Son went to dinner at I Cugini in Santa Monica with a bunch of his coworkers who were in Southern California for the week. One of them was unable to finish her Pizza di Prosciutto, and since she was staying in a hotel she gave it to Son. He brought it home for me to try. I loved it… and thought that it would be great in sushi! So here it is. 🙂 The prosciutto is really salty, but the bitterness of the arugula balances it out very nicely. This would make a great hors d’ouvre at a nice party, since it’s easy to handle, not to messy, and still a fancy sort of food. 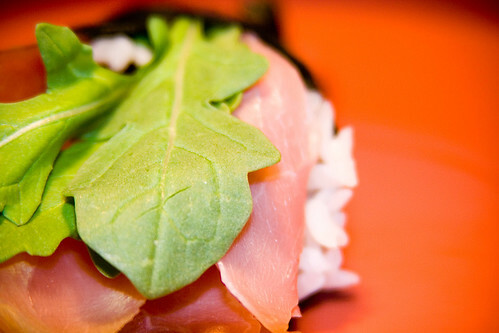 Roll the temaki sushi, using one slice of prosciutto and for leaves of arugula as your fillings. Hold on a minute….you not only are a sushi chef but you program too? In Java? The Son is one lucky man…interested in this “project” you are keeping from us. Oh I saw Prosciutto and instantly thought wow that’s going to be tough one to sell…I don’t think I ever had Arugula before so I am not sure what the taste would be like. Very interesting. Too bad I really hate arugula/rocket, and I get sick from prosciutto… I’ll switch for serrano ham though ! 🙂 Yummy yummy! I love the pictures though, love how the orange background brings out the red-orange in the prosciutto. Ralph – Hehe you are sweet. I am learning Java… I don’t think I could be considered a real programmer yet, but I am working on it! Hopefully by the end of the year. 🙂 I probably won’t start really working on this project until the end of the year when I am more comfortable programming in Java, so it could be a year or more until I can really say much about the project. By itself I’m not a huge fan of prosciutto, but it actually tasted really good in sushi! Arugula is bitter, but not overly so. I was wondering, you seem to be able to find sushi-grade fish. Other than online, where is a good place to find fresh fish locally? I am a native of Michigan but live more in the city than anywhere that produces fresh fish. 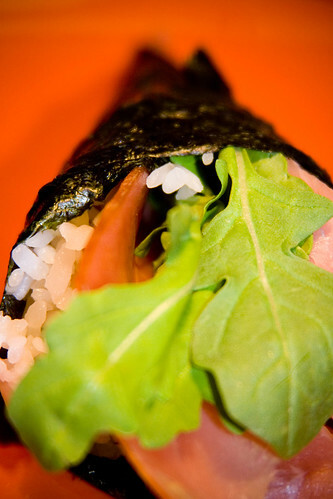 Tiffany – I actually have not used any raw fish in my sushi, so I have not needed to find sushi-grade fish yet. I have seen already prepared sashimi at Japanese stores, so you could use that if you have Japanese stores near you. Eventually I will start using raw fish in some of my sushi, and when I do I will definitely have a post about it! 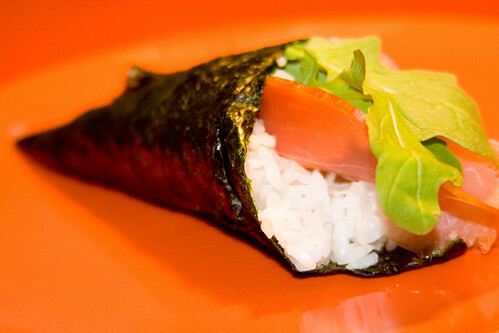 Right now I’ve got inari sushi in the freezer and am planning on making summer rolls this weekend. And maybe some miso soup as I have a whole container of white miso in the fridge. Hehe true… we had a bunch of arugula left over and we were like… what are we going to do with all this?!?! If you do get arugula, I recommend this recipe to use it all up. This is how we used up our arugula, and I know I will be making this recipe again – it’s surprisingly good! 😀 Ooooh miso soup! I haven’t had good miso soup in a long time… I am definitely going to have to make some soon! Speaking of arugula … I found a recipe for an arugula pesto with walnuts which might be tasty on that site. I’m a big pesto fan especially now that my parents have finally started growing monstrous quantities of basil on their farm for me. I cheated and made miso soup using Ajinomoto brand hon-dashi and white miso paste. It was quite tasty though a BIT on the salty side which I have to adjust for. But ok for a first trial. I’m leaving for France tomorrow until September 7th. Will see if I can get some ideas for sushi rolls there! I tried last week a maki arugula with fried crispy bacon and havarti cheese. Lara – Ooh that sounds pretty yummy! Mmmmm miso soup… that sounds really good right now! Robert-Gilles – Yay for France! I’ve always wanted to go.